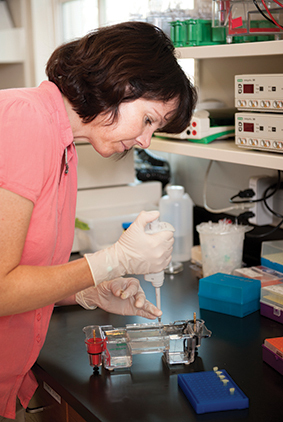 Carol Duffy works with herpes simplex virus type 1 in her lab. Together with a Tuscaloosa-based surgeon, she has discovered that the virus is linked to several illnesses researchers previously thought unrelated. Carol Duffy is proof that changing your mind is not only acceptable, but that doing so can often lead to something momentous. Duffy, an associate professor in the Department of Biological Sciences, is headed somewhere that very few faculty members have the chance to go – to a third phase clinical trial for a drug combination that has shown promising results to treat not only one, but several painful and debilitating illnesses. How have researchers not found this far-reaching treatment before? Because it never occurred to them that diseases such as fibromyalgia, chronic pain, and irritable bowel syndrome could be caused by a virus, specifically herpes simplex virus type 1. This virus causes cold sores and forever lives in the body of anyone who has been exposed to it, which amounts to about 90 percent of the population. Another fact that physicians didn’t realize is that HSV-1 is best kept at bay using not just antiviral medications, but through a combination of antivirals and other drug types. That’s where Duffy, The University of Alabama’s resident expert on HSV-1, has been able to shed some light. As an undergraduate zoology major at Northern Arizona University in Flagstaff, Arizona, Duffy never imagined that she’d become a virologist. Her dream was to become a veterinarian. She stayed in her hometown of Flagstaff because she wanted to remain with her horse. In a zigzag path of trial-and-error, Duffy shadowed vets, worked in the medical research and development division of a manufacturing company, and conducted research as an undergraduate in her advisor’s lab. Through these experiences, she stumbled upon two things she realized she loved more – research and microbiology. Duffy nixed the idea of going to vet school and instead received her doctorate in microbiology in 2000 from the University of Iowa. She began working on viruses as a doctoral student because she was fascinated by parasites. Like her career choice, she also happened upon her research focus, HSV-1. At the University of Iowa, she studied the DNA packaging mechanisms of bacteriophage lambda, a laboratory virus useful for quick experiments but limited in its scope. It could infect only bacteria. Seeking a virus with similar mechanics but broader applications, Duffy started studying the human pathogen HSV-1, first as a postdoctoral researcher at Cornell University and then again in her lab at UA beginning in 2007. It wasn’t until 2011 that Duffy met Dr. William “Skip” Pridgen, the man without whom she never would have discovered HSV-1’s link to a host of diseases researchers previously thought unrelated. The Friday before spring break of that year, Duffy received a phone call from Pridgen, a Tuscaloosa-based surgeon. He presented her with a dilemma of his own. So Pridgen began asking his patients if they would be interested in taking an antiviral medication, Famvir, which prevents various strains of herpes viruses from replicating. Desperate for a solution and with nothing to lose, many of his patients agreed. Some of these very same patients also had symptoms of arthritis, for which Pridgen would give them samples of the anti-inflammatory drug Celebrex. He needed Duffy to help him prove it, to show that a herpes virus really was causing these diseases, and he needed her to explain through research why this particular drug combination worked. “He told me his story, and I thought, ‘It’s so different that he’s a surgeon and he’s using antivirals, but I’m in. I want to work on this,’” she said. The fact that the two drugs worked better together was no surprise to Duffy. Previous research had shown that a particular family of herpes viruses increases the production of COX-2, an enzyme found in most cells whose levels rise during periods of inflammation. Celebrex, a COX-2 inhibitor, stabilizes COX-2 levels and, in doing so, causes herpes virus particles to become unstable. Their biggest challenge, as Duffy saw it, would be to show that the virus is causing the symptoms. Chronic gastrointestinal conditions such as peptic ulcers have been considered bacterial infections for decades and are often treated with antibiotics. Fibromyalgia, on the other end of the spectrum, has been thought to originate in the nerves and muscles, causing pain. Duffy needed to show that these patients’ symptoms – things such as extreme pain, sleep disturbance, exhaustion, and headaches, among others – were being caused by an immune system response to a virus. “I told him I wanted to see the tissue because nobody is going to believe us unless we show that the virus is there,” she said. Approved for a study, she examined tissue samples from 45 patients with chronic GI issues, each sample taken from the patient’s’ GI tract, where Pridgen had found deep red streaks that were similar, but not identical to, spots found in patients with bacterial infections. But after extracting DNA from the tissue samples and using an antibody technique called immunoblotting that would debunk any theories of lab contamination, she realized she was wrong. All the tissue samples were infected with HSV-1 and no other herpes virus. A pathologist also studied the samples, and only three of the 45 tested positive for the bacteria that was thought to cause the disease. But their challenge didn’t end there. In order to get the U.S. Food and Drug Administration to approve a new treatment, they would need to complete several clinical trials. The first of which, a second phase, placebo-controlled clinical trial, would cost approximately $4 million. With federal funding scarce, the duo decided to start their own company called Innovative Med Concepts, for which Duffy serves as the chief scientific advisor. In March 2012, they began looking for investors who might be interested in funding the trial, making daytrips throughout the Southeast when their schedules allowed. On several occasions, Pridgen would borrow a friend’s private plane, meet Duffy at the Tuscaloosa Regional Airport at 5 p.m., fly to nearby cities such as Atlanta to make a pitch, and return to Tuscaloosa by midnight in order to be at work at 8 a.m. the next morning. By May 2013, they had raised enough funds to start a small-scale, second phase trial, which they finished in January. By March, they had raised a total of $5 million. Despite the trial’s small scale – they enrolled a little more than 140 people – Duffy says the results were incredible. They were so promising, in fact, that the duo has continued to convince key players in the field to join their cause. Mike Gendreau, a practiced designer of clinical trials who helped bring the fibromyalgia medication Savella to market, designed their first trial. Rick Burch, a University of Alabama alumnus and former senior vice president of the pharmaceutical company Pfizer, became president of Innovative Med Concepts in March. Daniel Clauw, director of chronic pain and fatigue research at the University of Michigan and one of the world’s leading experts on fibromyalgia, joined their scientific advisory board. As Duffy and Pridgen look to conduct a series of larger-scale, third phase clinical trials – a cost they’ve estimated to be $50-$100 million – they are searching for the quickest, most cost effective way to get their treatment to market. Though the team is still mulling over their options, Duffy says they will likely seek funding from foundations that support research related to the diseases their drug shows promise to treat. The team might also partner with a pharmaceutical company or a venture capital firm willing to fund the trial. In the meantime, Duffy is working to develop diagnostic tests that doctors can use to determine whether patients would benefit from taking the drug. The team is also looking to conduct toxicology tests to determine whether a larger dose of the drug would be safe and make the treatment more effective. Considering what brought her to this point, Duffy said, “I give a lot of credit to this University and to my department. At a lot of universities, they expect you to get funding from specific places, and since federal funding is so hard to get these days, a lot of faculty put all their eggs in one basket and only focus on one thing.